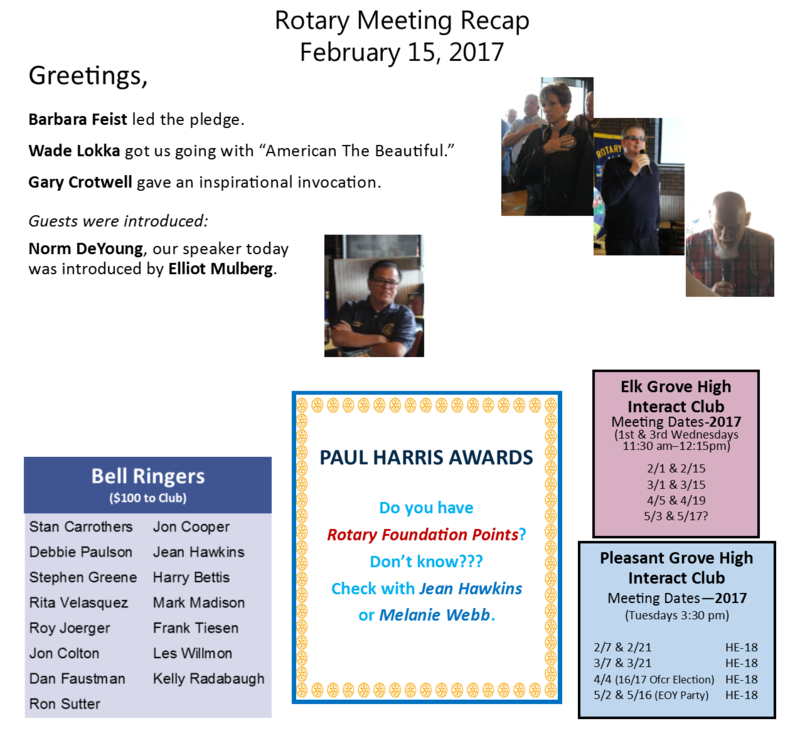 Want to make an impact to Elk Grove and The World? You've come to the right place! 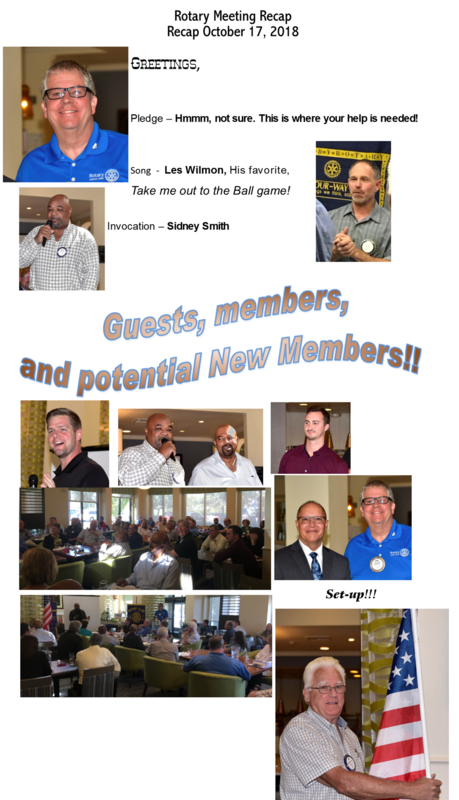 Connect with Us Subscribe to Our Newsletter Make a Difference - Join Us! 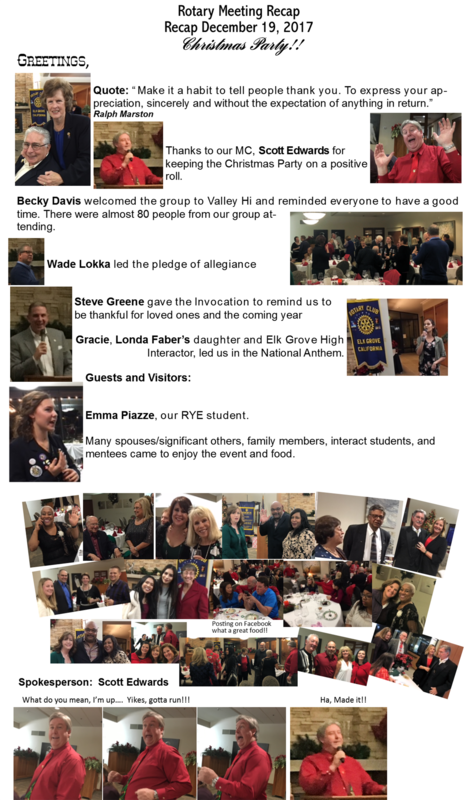 The Rotary Club of Elk Grove partnered this year with the Rotary Club of Laguna Sunrise to present “Breakfast With Santa” on December 13th was very successful. 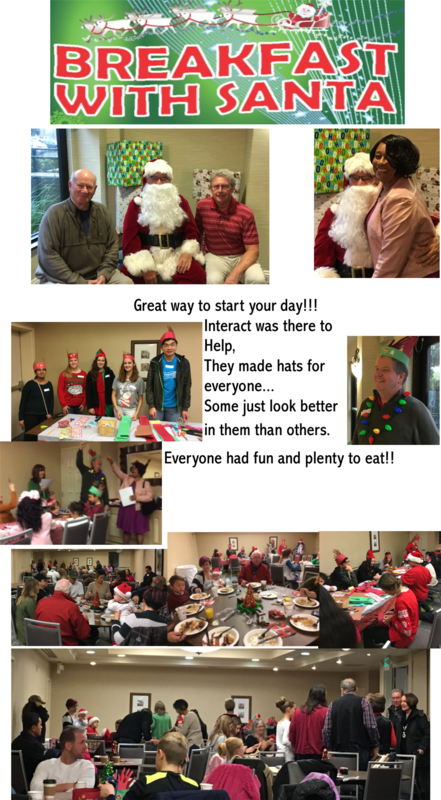 Many thanks go to Kelly Radabaugh, event coordinator, and to the Interact students for their help with crafts and serving. 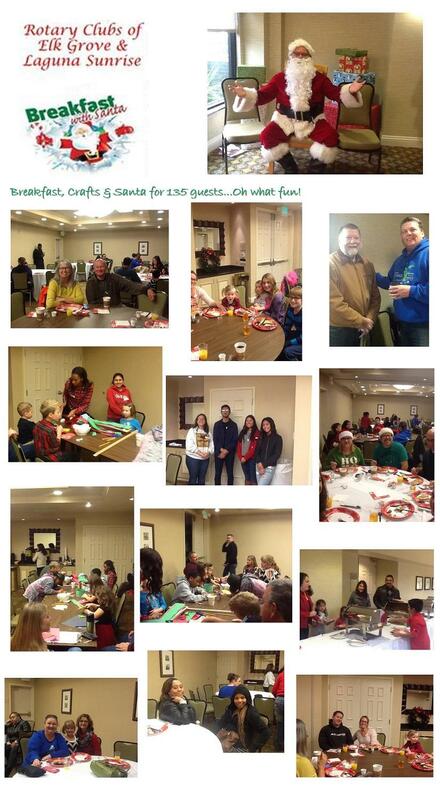 We appreciate “photo Joe” (Worsley) for lending us his expertise and for our own “Santa”, Bob Lent, who hosted 135 guests. 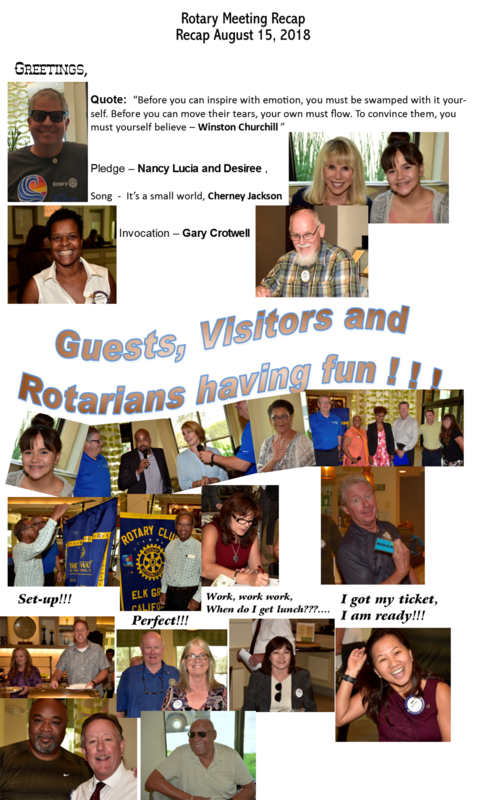 Also a big shout out to Melissa Caccia, manager of the Hilton Garden Inn, for the wonderful venue. 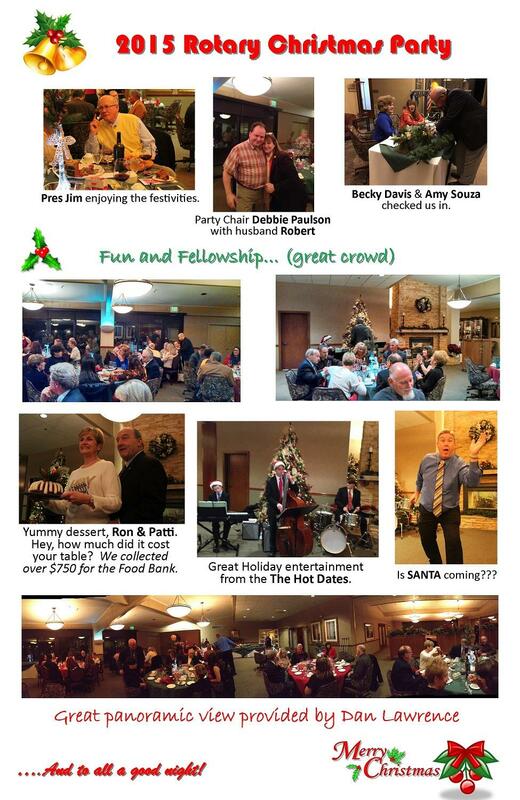 President Jim Babcock said this year’s Rotary Club of Elk Grove Christmas/Holiday party and dinner at Valley Hi Country Club on December 10th took place in true Rotary fashion…with good food, fun and fellowship, seasonal musical entertainment from The Hot Dates trio, and of course, helping the community. 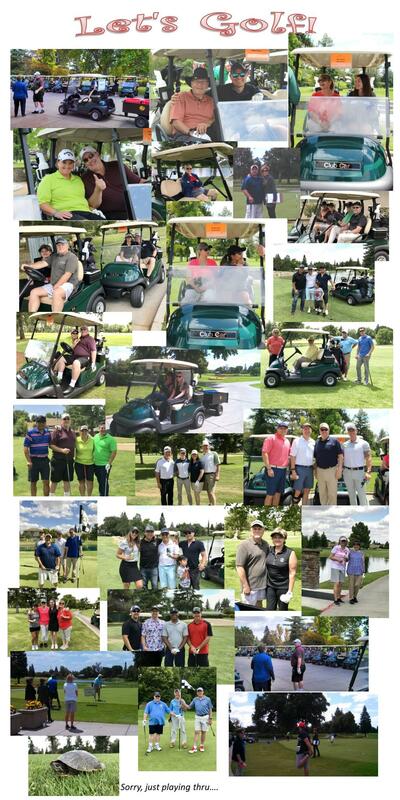 Kudos to Debbie Paulson and her committee who did a super job coordinating the event, even down to the “Raffle” for desert that generated nearly $800 to be donated to the Food Bank. 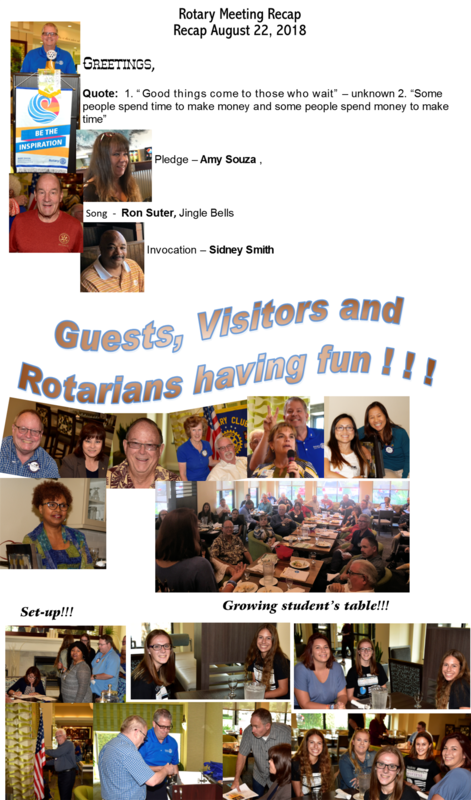 Wednesday, December 16th the Rotary Club of Elk Grove met at Project R.I.D.E. arena for lunch and the Christmas Party for students at Jessie Baker school. 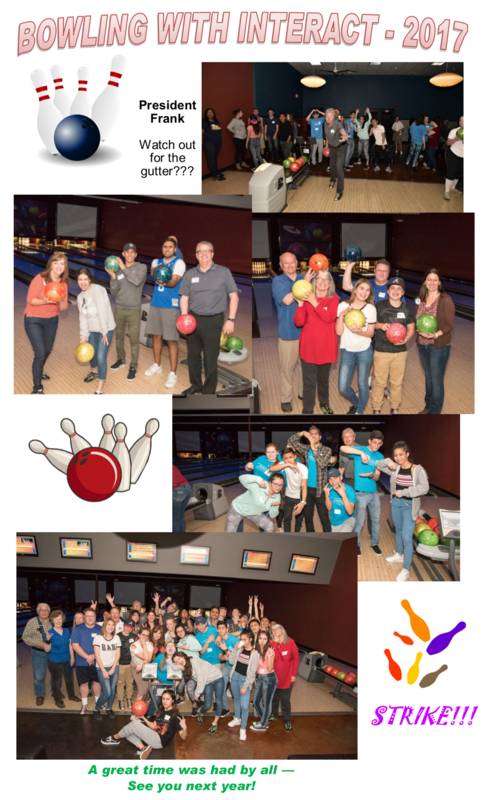 Established in 1962, Jessie Baker is one of the most remarkable schools in the Elk Grove district, and it has the distinction of being the first public school for children with severe disabilities in the state of California. 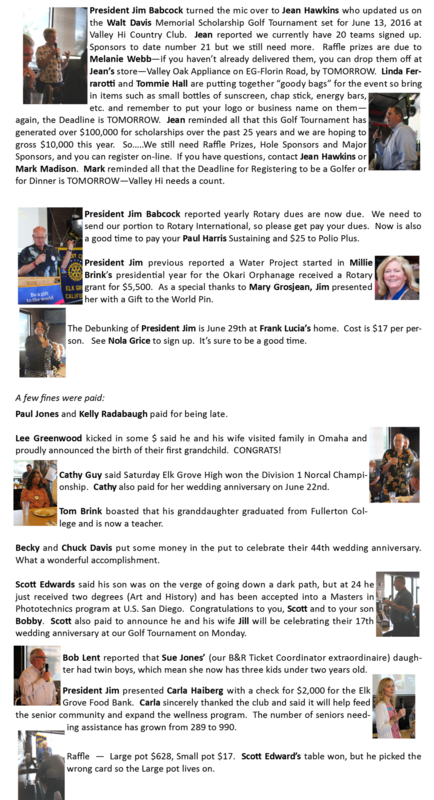 The Rotary Club of Elk Grove has been hosting this luncheon for over 40 years, providing funding for presents that Santa gives to the children at the Jessie Baker Christmas party. 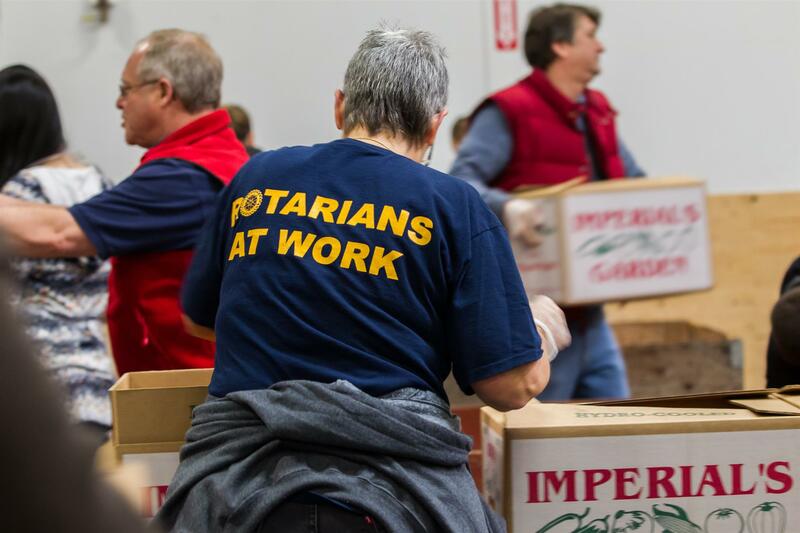 Our Rotary Inner Wheel Club graciously wrapped the 180 gifts distributed by Santa this year. 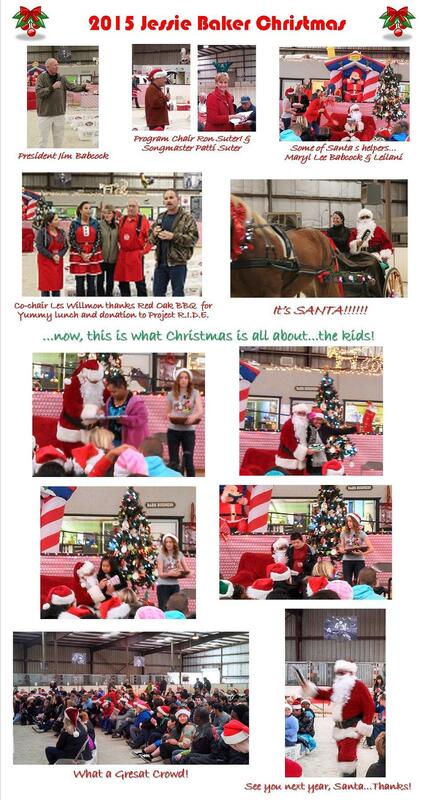 Jessie Baker teachers do the shopping to insure the right gift is given to the right child. 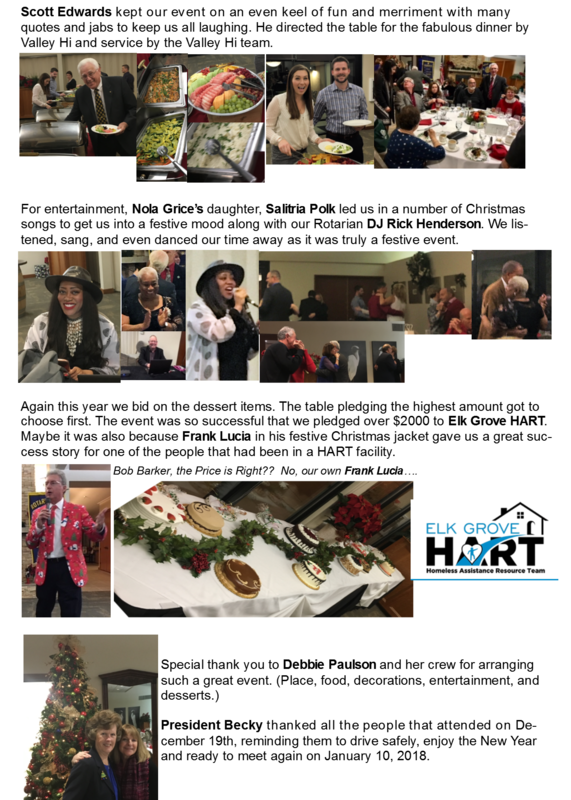 We had a wonderful turnout and Kudos go to program chair, Ron Suter, co-chair Les Willmon, songstress Patti Suter, Santa's helpers Maryl Lee Babcock and granddaughter Leilani - just to name a few helpers, and of course, Santa (Bob Lent) for making this another successful, fun and heart whelming event. 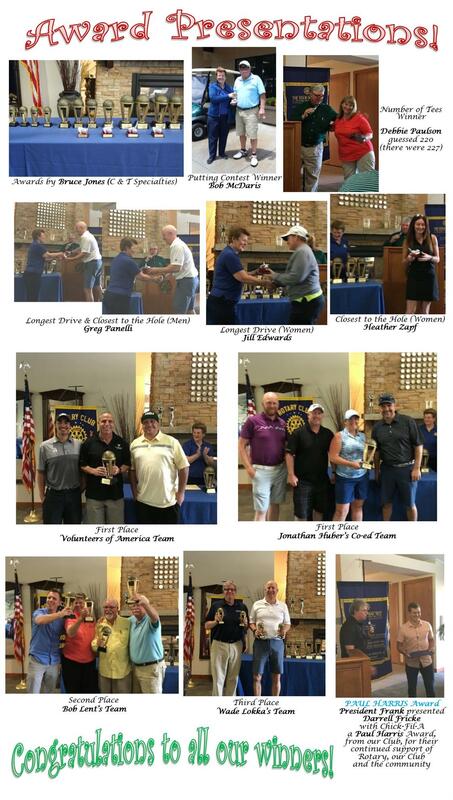 Thanks also to Red Oak BBQ who provided lunch and donated 100% of the proceeds back to Project R.I.D.E. 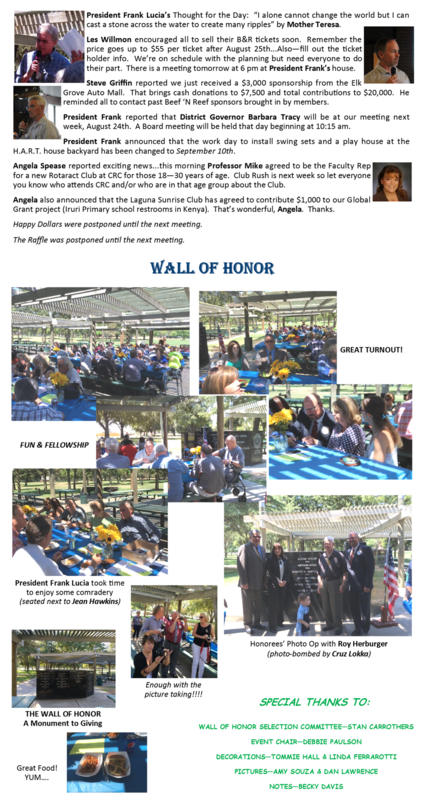 Our Club then added to that donation with an additional check for $1,000 to Project R.I.D.E. 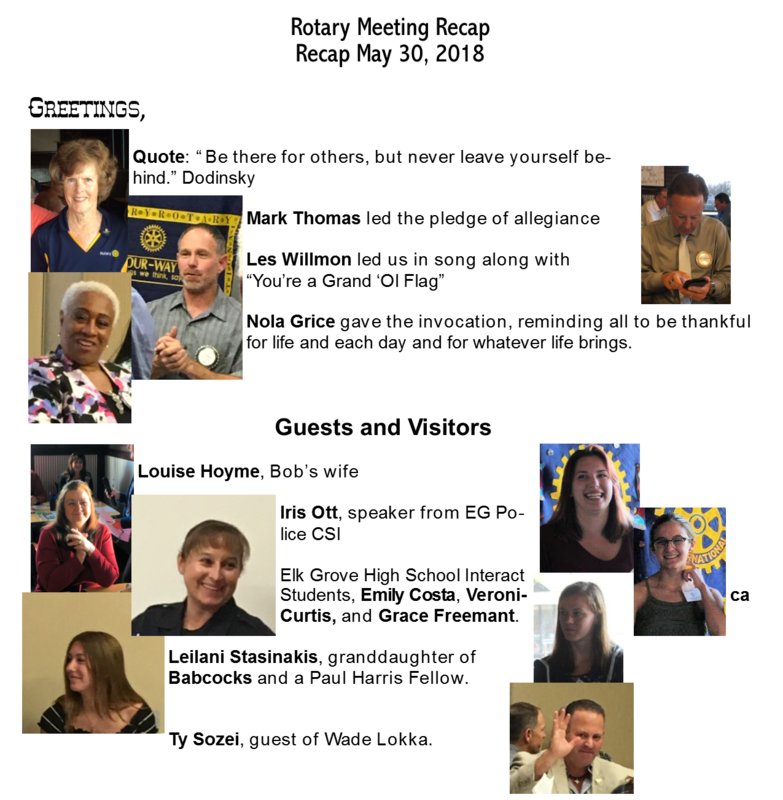 We've had a great start for this 2015-2016 Rotary year starting with our first meeting of the year in Elk Grove Regional Park and a great visit from our new District Governor Glenn Fong. 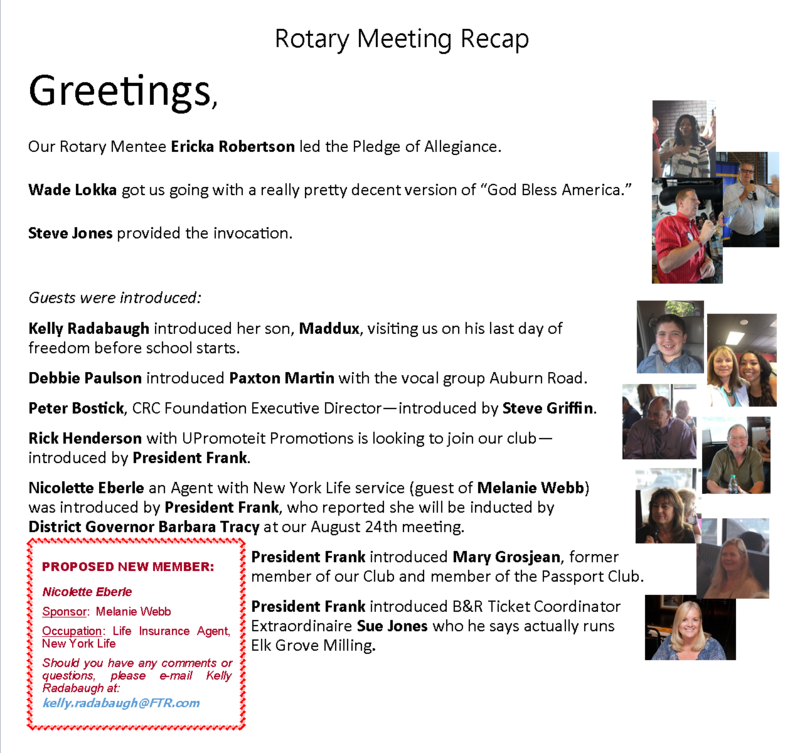 A special thanks to Past President Bob Hoyme for filling in for me on July 8th while I was in Cincinnati. 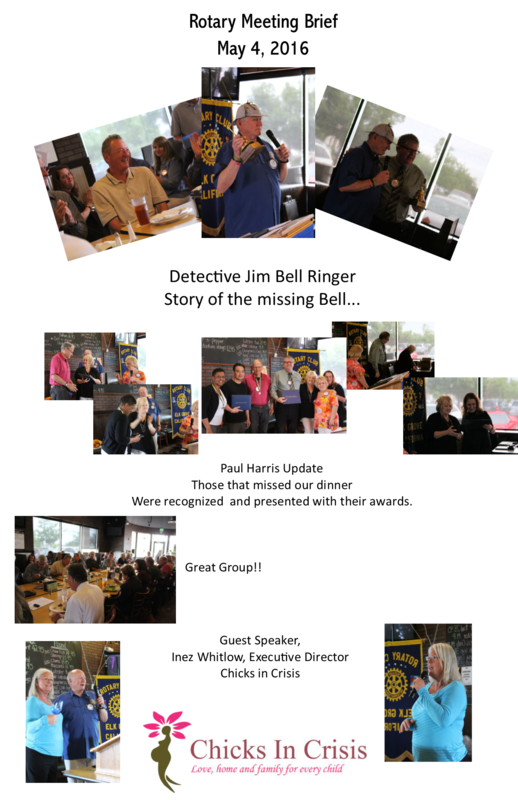 Our July 15th meeting was a great tap dance when our planned speaker was a no show. 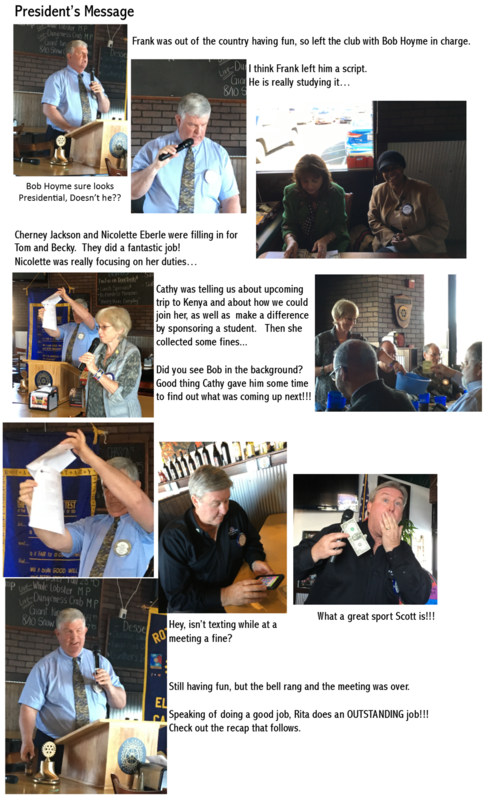 Our very own Mark Madison volunteered to be our speaker and did an excellent jog giving us an update on local and state water issues and fielding specific questions. 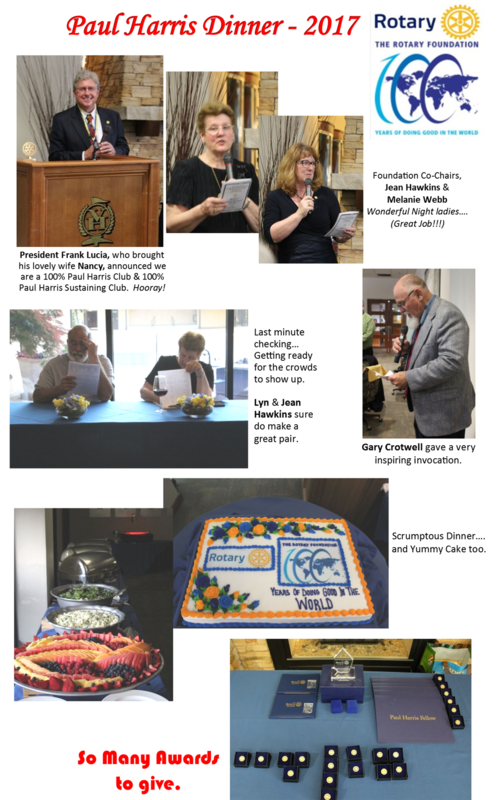 Wednesday, July 22nd, our guest speaker was Supervisor Don Nattoli. 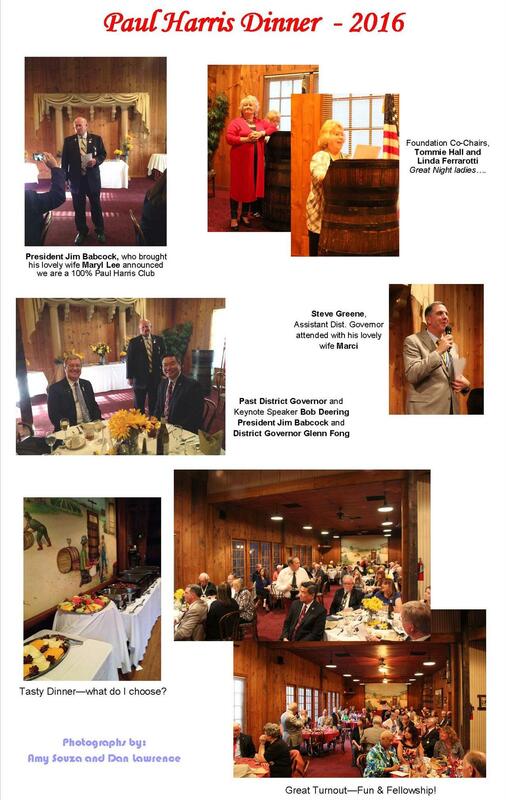 His update on County issues was very informative as always. 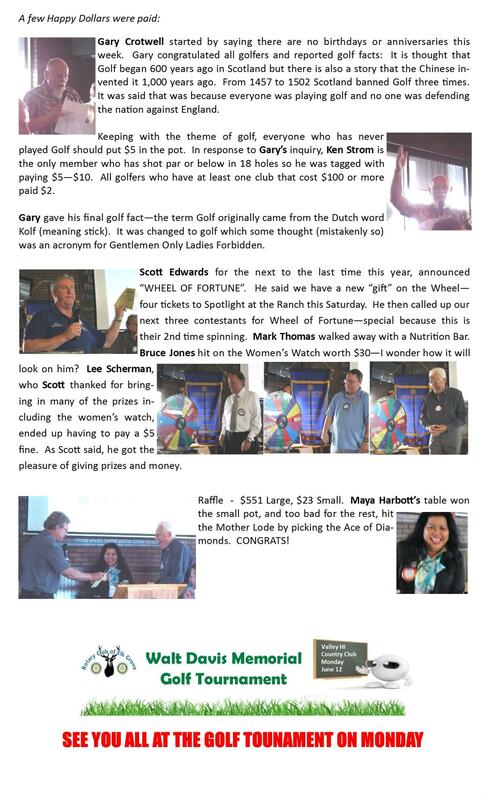 The Kohl's kids event was Saturday morning July 25th and we had a great Rotary turnout. 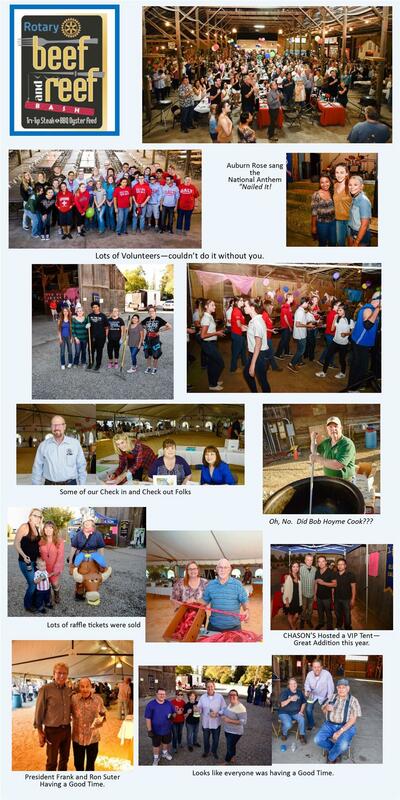 The Strauss Festival was Thursday July 23 through Sunday July 26 and went off without a hitch thanks to Roy Joerger and all the Rotary volunteers. 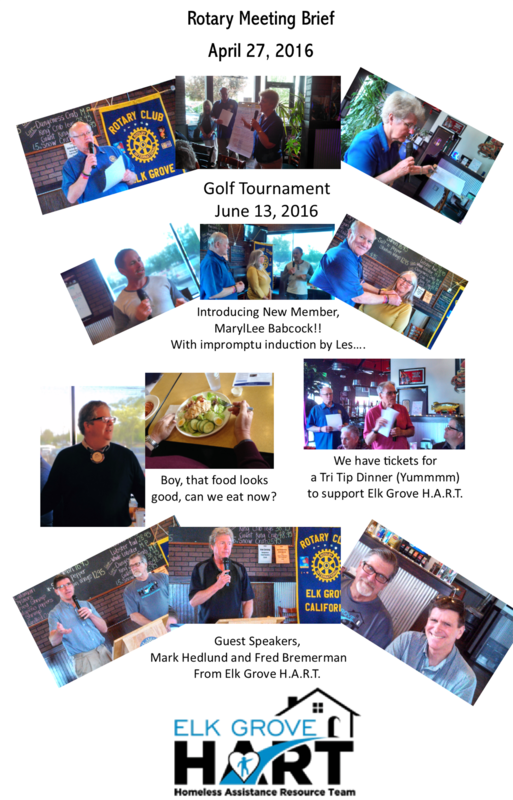 Please join us for lunch on Wednesdays, noon, at Vince's. 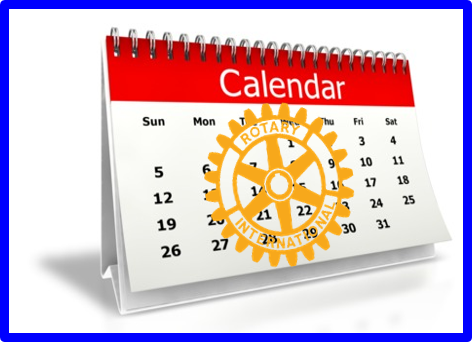 August 12 will be a catered lunch at Rotary Grove in Elk Grove Park, instead of Vince's, where we will recognize some new additions to the Elk Grove Rotary Wall of Honor! President Mark Thomas got the evening started. 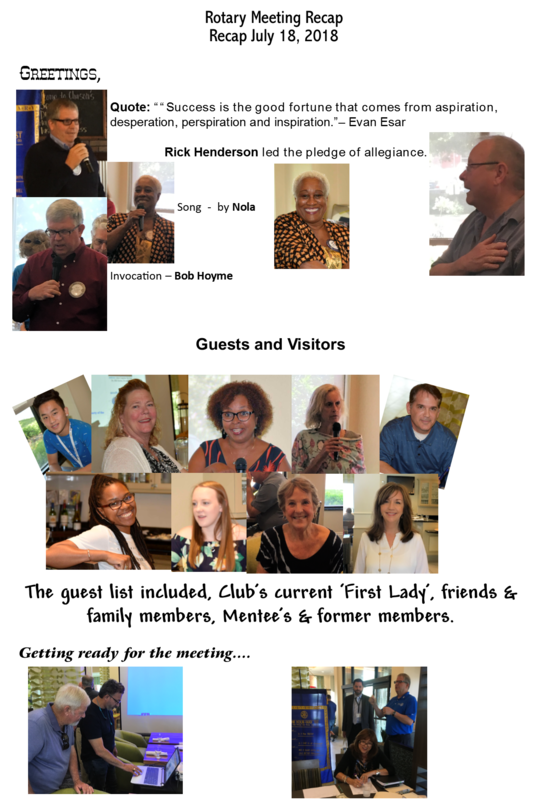 Leading us in the pledge of allegiance was PDG Clarence Parkins. 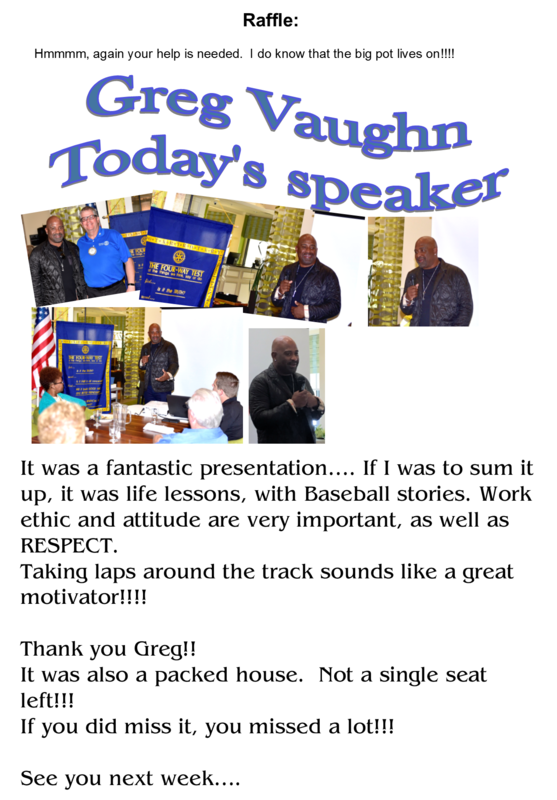 Gary Crotwell followed with an awe-inspiring invocation and encourage all to promote Peace Through Service. 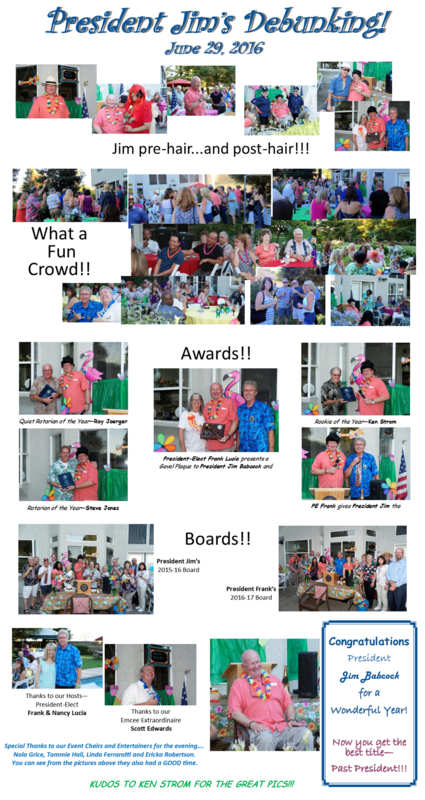 District 5180 District Governor Fred Teichert and his wife Nancy, Assistant District Governor Steve Greene and his wife Marci, Past District Governor Clarence Parkins and his wife Sally. 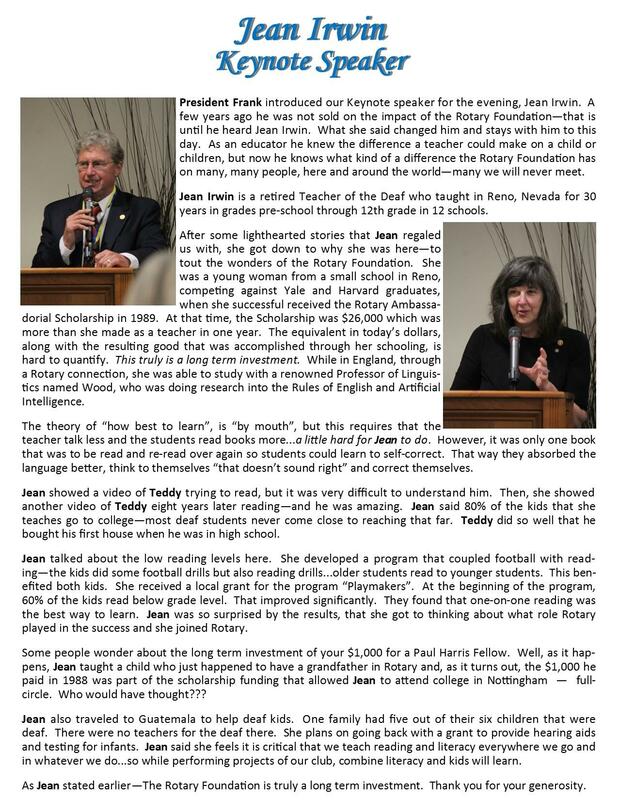 Also attending were Keynote Speaker Bob Mutchler (Motorcycle Bob) and his wife Patti. 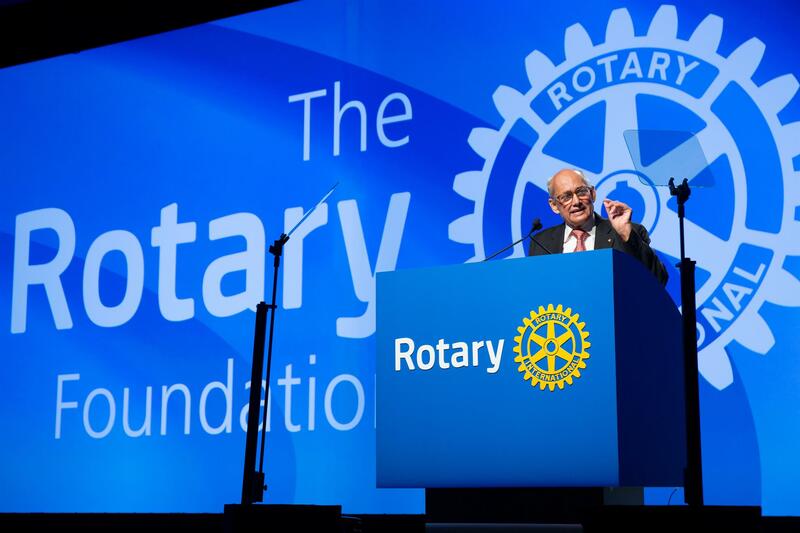 District Governor Fred Teichert addressed the group and expressed his thanks and appreciation to our Club for all we do. 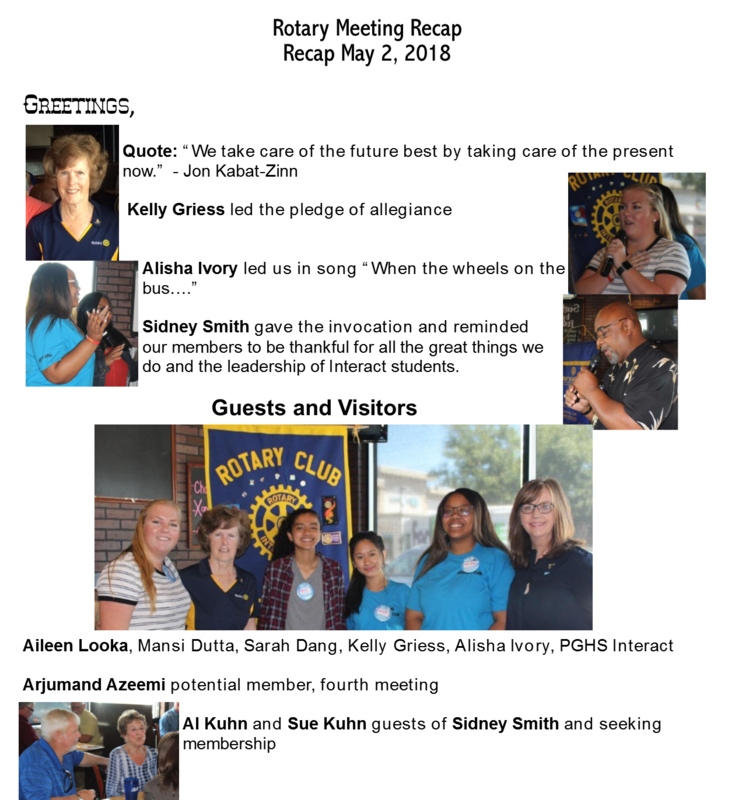 The Rotary Clubs of Elk Grove and Laguna Sunrise formed a partnership, wrote a matching-funds Rotary District grant and worked together to provide emancipated foster youth, relocating within the local Elk Grove community, an “Emancipation Basket”. 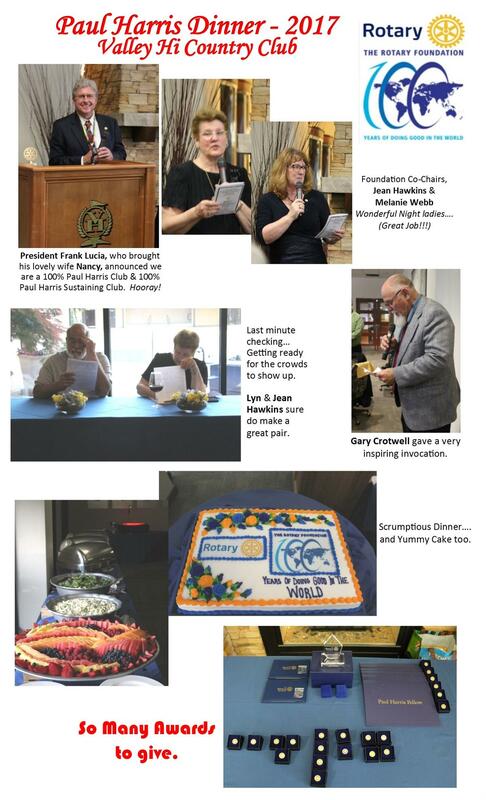 Valued at approximately $300-$350, each “basket” contained basic kitchen appliances and cookware, non-perishable food items, a gift card to a local grocery store for perishable foods, various cleaning and personal hygiene items, and additional miscellaneous items based on individual student need. 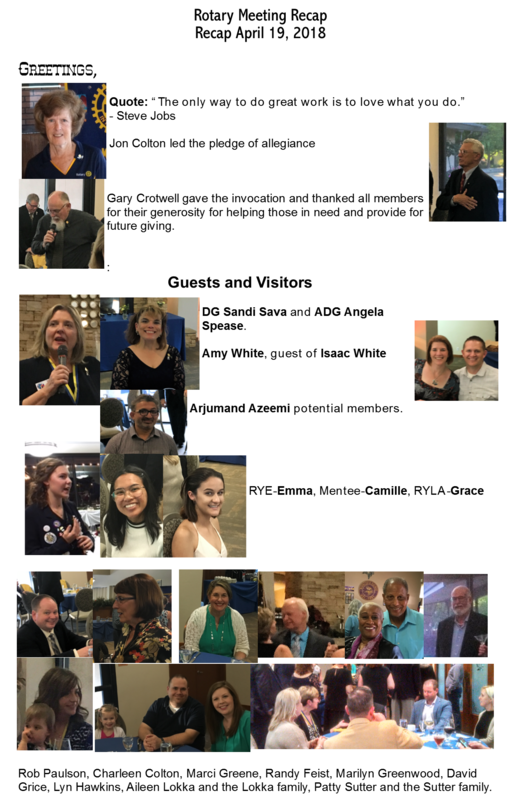 All items were purchased and stored in the warehouse of Floor to Ceiling, and, on Monday, January 13, Rotary members picked up items to deliver to students. 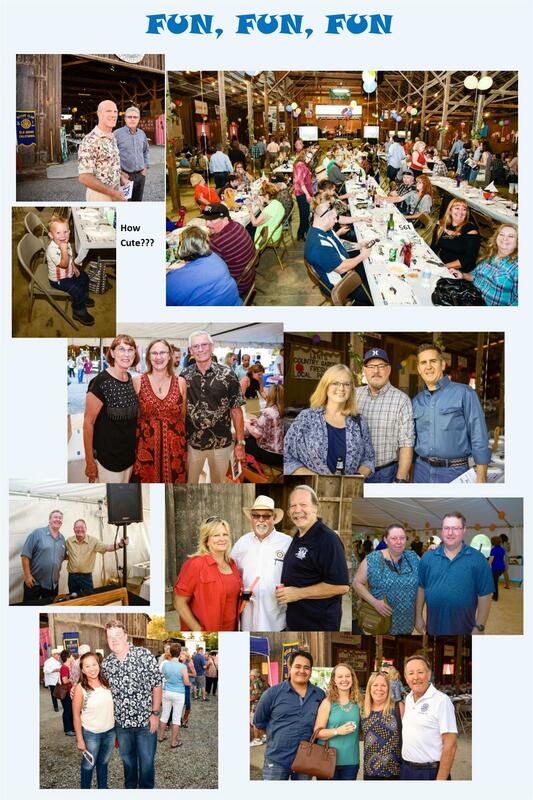 The Rotary Club of Elk Grove hosted our 7th Annual Rockin’ Beef & Reef tri tip and oyster fundraiser at the Lent Ranch on September 29, 2012. 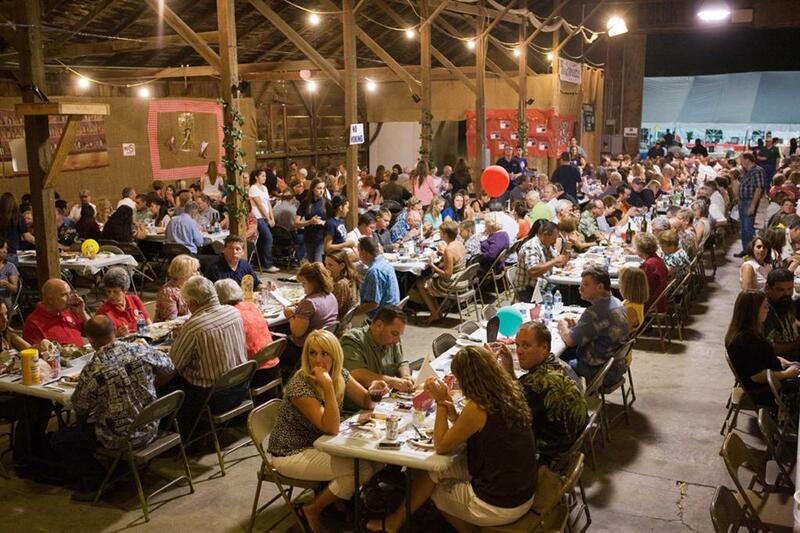 We had over 400 attendees, who enjoyed the food and helped us to raise over $35,000 for our Foundation. 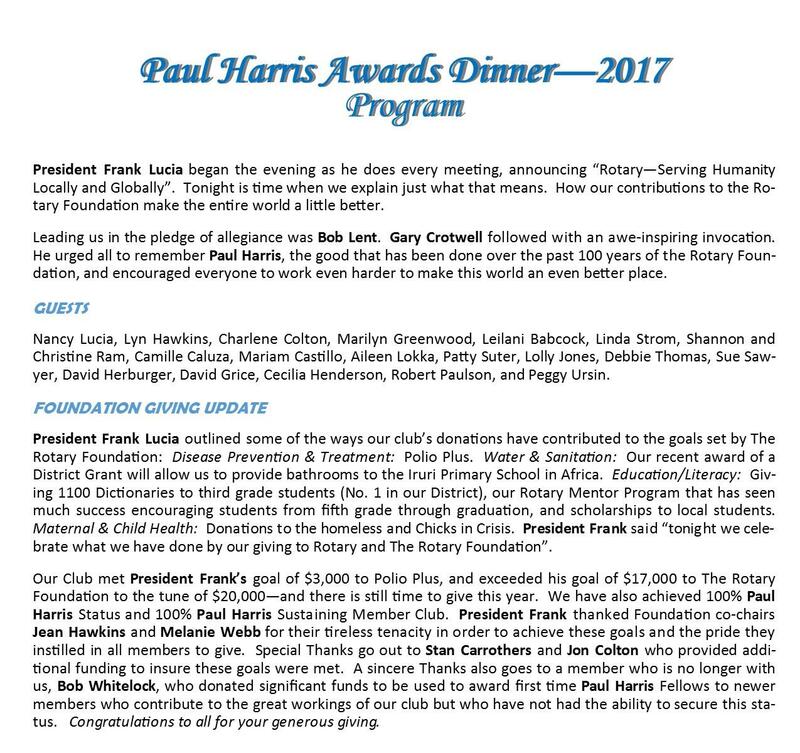 We support community causes such as literacy programs for local elementary students, Elk Grove Senior Center, Elk Grove High School FFA and Wrestling team, Elk Grove Food Bank, Project RIDE, dictionaries for 3rd graders and operating costs for transitional housing for our local homeless population. 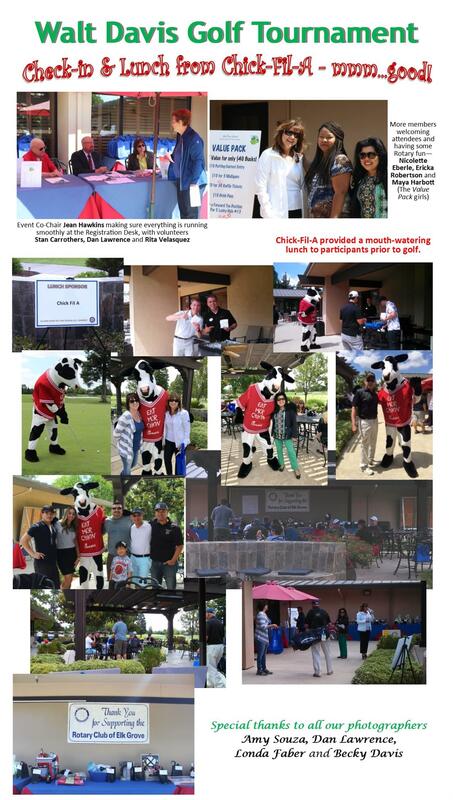 Thank you all for your support and please save the date for next year, September 28, 2013! 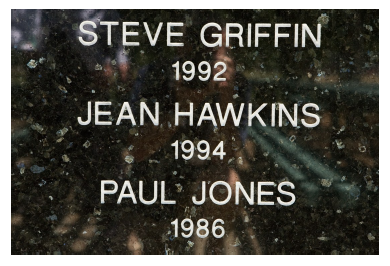 Congratulations to Steve Griffin ,Jean Hawkins, and Paul Jones, our rnewest inductees on the Wall of Honor. 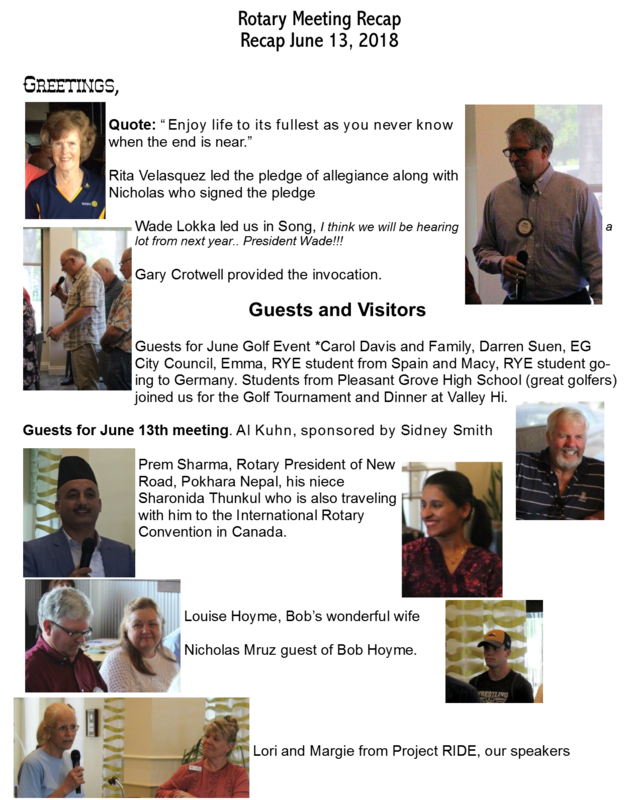 Their contributions and dedication to Rotary and the community have not gone unnoticed. 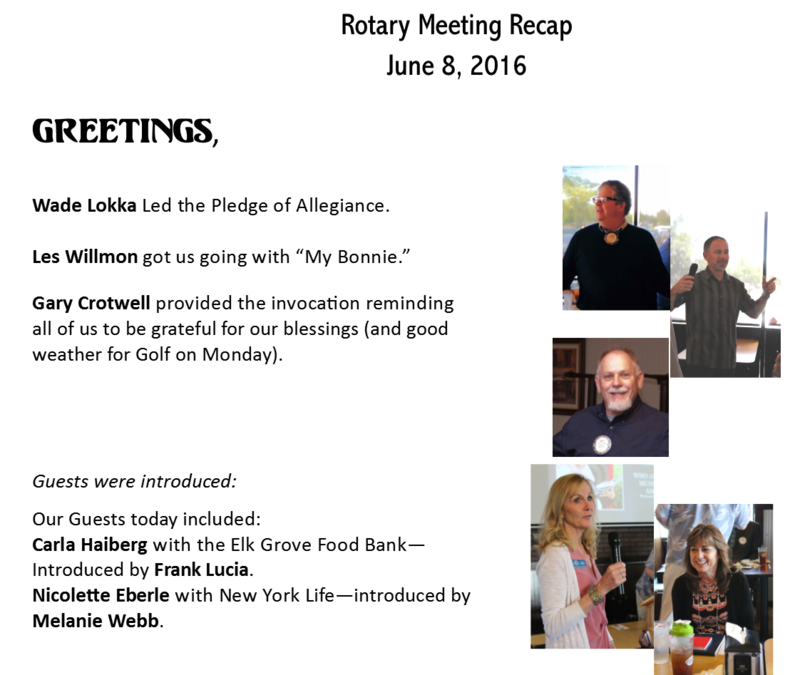 We truly appreciate all of their past and continuing involvement in Rotary. 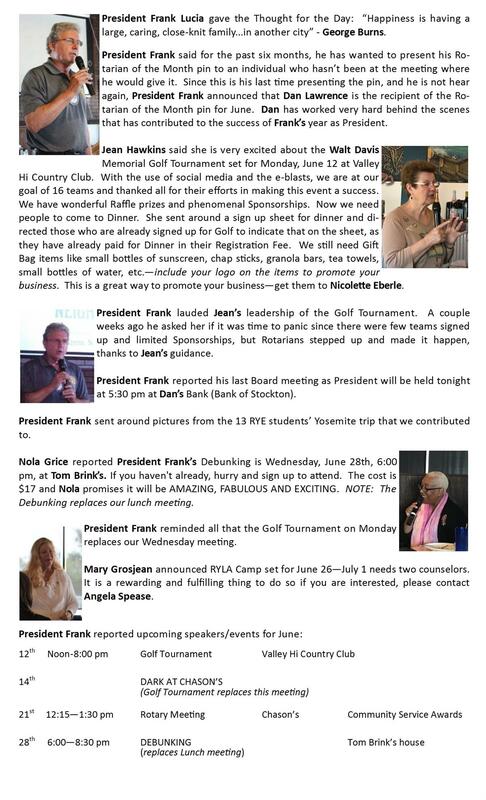 Elk Grove City councilmember Sophia Scherman presented Rita with a Resolution from the City acknowledging all her work as President this past year. 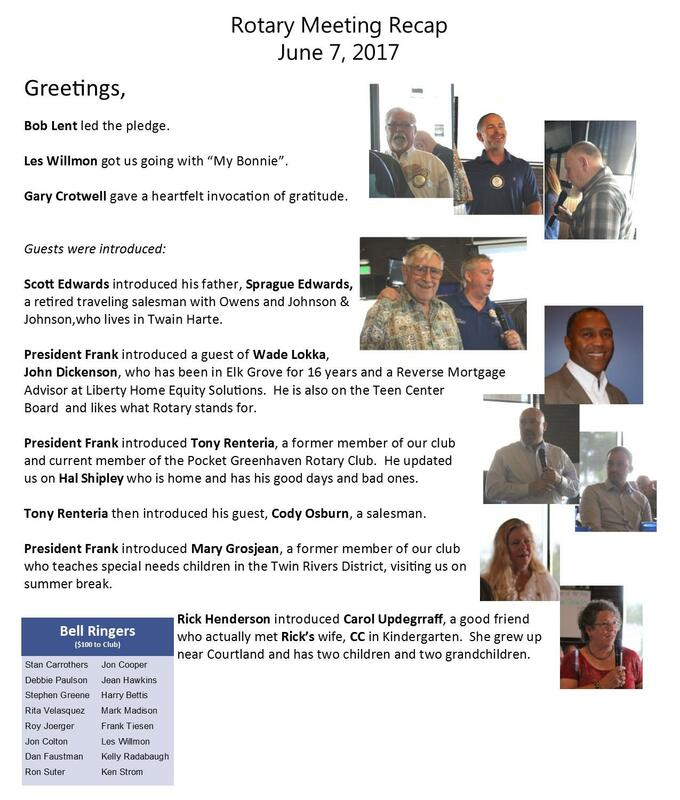 Past District Governor and previous Elk Grove Rotary Club member Hal Shipley inducted 2012- 13 President Barbara Feist the 2012-13 officers: President -Elect Sean Wright, Treasurer Don Cope, Secretary Melanie Webb, and Board members: Past President Rita Velasquez, Kelly Radabaugh, Frank Lucia, Christie Drew, Millie Brink, Greg Heguiagaray, Mary Grosjean. 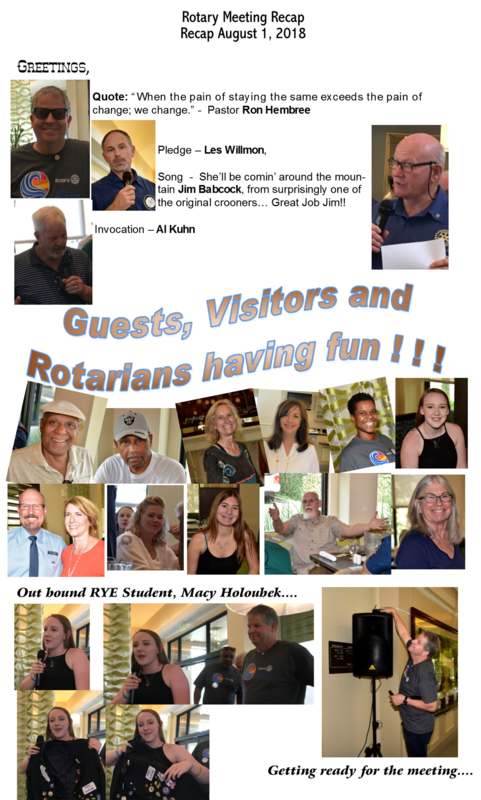 Barbara thanked everyone for committing to service for our new Rotary Year – we appreciate it!